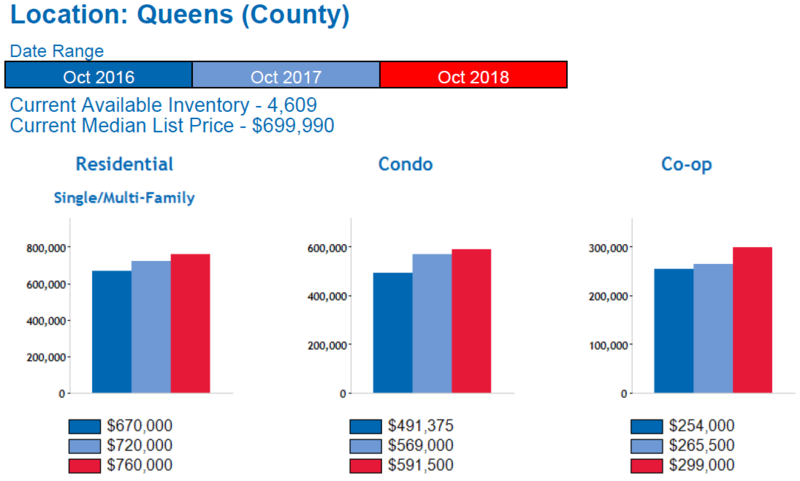 Queens Real Estate Market Report November 2018, provided by the Queens Home Team at Keller Williams Realty Landmark II. Need help? Feel free to Contact Us anytime. Happy Thanksgiving everybody! November is here and we have a lot to be grateful for. No matter what your circumstance, I think we can all agree that we should count our blessings each and every day. We are nearing the end of 2018 and as we approach the final days of the year we can say that this year has been a shifted year in terms of the Queens real estate market. 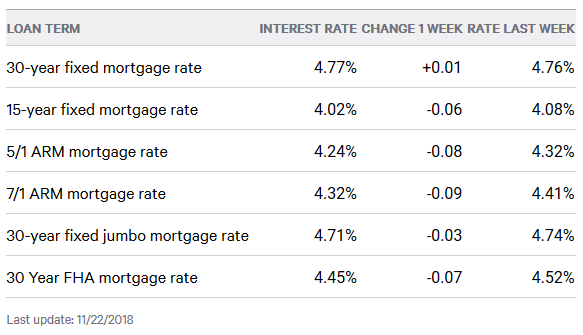 Most of this year’s market has been driven by higher interest rates, media speculation of prices going down, and an overall dip in demand as a result. The lower demand we’ve seen this year has ultimately led to more inventory staying on the market. All in all we are ending the year in a balanced market (i.e. 6-7 month’s supply) and that is similar to what we had in October of 2015. The difference now is that things are trending in favor of buyers whereas in 2015 things were trending more in favor of sellers. In terms of home sales, they have been down pretty much all year. For example, eight of the last ten months have experienced year-over-year home sale decreases and being that inventory is actually growing every month, this likely signifies a decrease in demand as opposed to lack of inventory. As for home prices, the median home price in October was still up over October of last year, however, it was the smallest year over year increase that we’ve seen in a long time, just 1.8%. 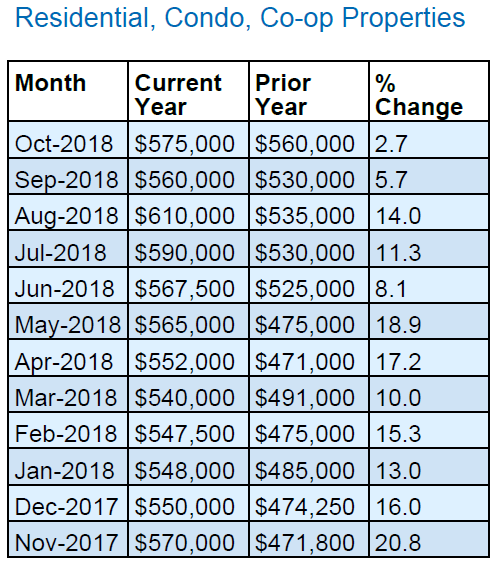 To put the median home price into perspective, in January of this year the median home price in Queens was $570K, and in October, the median home price in Queens was also $570K. This is likely a result of the higher interest rates and lower offers as a result. Regarding inventory, currently there are about 1,000 more homes on the market than we had in November of 2017. This increased supply is leading to a higher month’s supply which is the indicator of whether a market is favoring buyers or sellers. Last November we were in a deep seller’s market with just 4.9 month’s supply and this November we have month’s supply of 6.3 months. The good news is that 6-7 months supply is considered to be a balanced market. It will be interesting to see what happens over the next 3-6 months as the new tax law goes into effect, another rate increase looms, and with news of Amazon choosing Long Island City as half the location of their new HQ2. The Long Island Board of Realtors reported a total of 768 homes during the month of October. This was an increase of 15 percent from September but a decrease of 10.1 percent compared to October of last year. 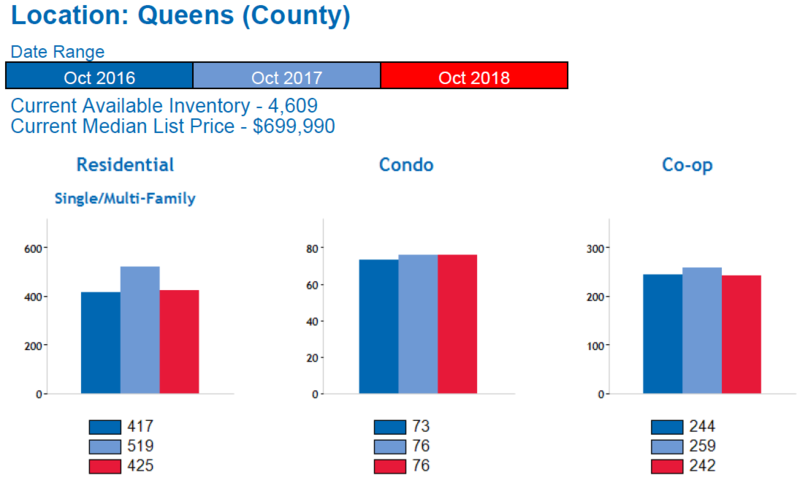 Specifically, our Queens real estate market report November 2018 shows that Residential home sales were DOWN 15%, Queens Condo sales were UP 6.6%, and Queens Coop sales were DOWN 5% compared to September of last year. Over the last 12 months, Queens home sales are DOWN 3.4%. For the month of October, the median home price in Queens was $570,000, this is an increase of 1.8 percent from September, and an increase of 1.8 percent compared to October of last year. The median home price has increased by approximately $10,000 since last year. Specifically, our Queens real estate market report November 2018 shows that the median home price for residential homes in Queens rose 5.5%, median home price for Queens Condo prices rose 4.7%, and the median home price for Queens Coop prices rose 11.1% compared to October of last year. Over the last 12 months, the median home price in Queens is up 11.9%. 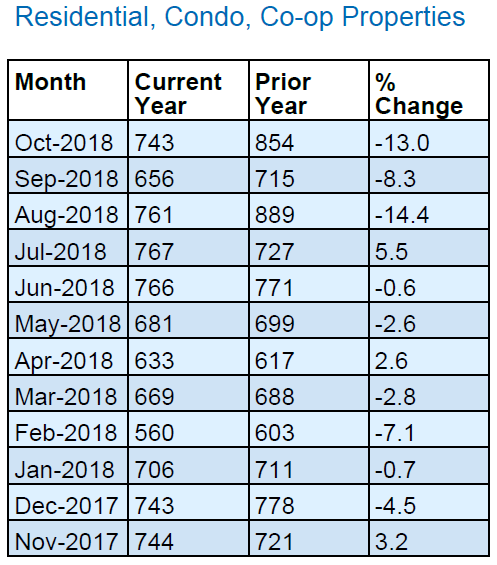 There is currently a 6.3-month supply of housing inventory in Queens, this is down slightly from the 6.5-month supply we had last month, and up from the 4.9 month’s supply we had in November of last year. There are currently 4,629 homes for sale in Queens. This is an increase of 1 percent compared to last month, and an increase of 36.2% compared to November of last year when there were 3,669 homes for sale in Queens.